MBDA’s Land Ceptor air defence system is making its show debut in the outside vehicle park at DSEI 2017 in London from 12-15 September. Land Ceptor utilises the next-generation Common Anti-air Modular Missile (CAMM) and is will be brought into service by the British Army as a replacement for the Rapier air defence system. Compared to Rapier, Land Ceptor has over triple the range (25 km+) and is able to intercept the most challenging targets in any weather conditions, including cruise missiles and precision guided munitions. 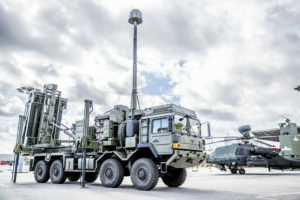 In total six nations have already chosen the CAMM family to provide their future air defence capabilities in both the maritime and land domains. In Royal Navy service the system is known as Sea Ceptor – which is also making its debut at DSEI 2017 off the back of successful first-of-class firings from the Type 23 frigate HMS Argyll. By purchasing the same missile to meet the air defence needs of both the British Army and the Royal Navy, development costs are significantly reduced and both services are able to utilise a common stockpile that will significantly reduce procurement and support costs. The Land Ceptor asset present at DSEI, which has been undertaking qualification trials for the British Army, features a substantially revised design to initial development prototypes and incorporates numerous new features. The decision to utilise the in-service HX-77 as the base vehicle for Land Ceptor enables the capabilities of the system to be expanded, whilst minimising the overall fleet size. A key new feature of the new design is its modular launcher. It features a palletised loading module enabling rapid reload of a full ‘magazine’ of munitions, and a self-mounting/dismounting capability allowing for a wider range of air/sea/rail transport options and for dismounted operations in fixed/semi-fixed locations. A common interface module means the launcher can be easily integrated onto a wide range of vehicles. The increased payload space provides greater flexibility in mission equipments carried, including – power generation, fire control electronics, on-board command and control (C2), missile datalink, radio communications and optional EO/IR sensor modules all available for installation. These systems provide flexibility for the launcher to act as an independent fire unit, as well as in a networked battery configuration. This increased payload could also be used to carry the extended range CAMM-ER interceptor, providing air defence out to 40km+ for those customers that require greater range. Land Ceptor is the launch configuration of the Enhanced Modular Air Defence Solutions (EMADS) stable. EMADS brings together best-of-breed systems and technologies from across MBDA’s European base to save time, development costs and provide a flexible system for air defence provision. EMADS features a family of system components, including the common launcher developed for Land Ceptor. Also included are a flexible command and control system capable of being installed on the launcher, within Radars or within a separated Tactical Operations Centre (TOC). An example of a TOC can be seen at MBDA’s DSEI stand (S2-210).